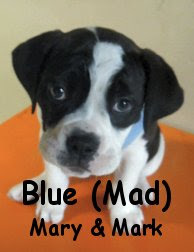 Fort Fido Dog Daycare & Boarding News Blog: Baby Blue! This little stunner is Blue, a nine week old, Old English Bulldog (like our longtime buddy Louis!). Tipping the scales at a scant eight pounds, the sweet and spunky gal started out upstairs with the other little guys, but it became pretty apparent that the personality of this wild child would be better suited to the medium roll. She's all about playtime, and did her best to keep up the pace! We caught this great clip of her and Cortez in the early morning, having a blast!